The ergoCocoon hybrid swaddle/sleeping bag is an ingenius hybrid of a swaddling blanket AND a sleeping bag for your baby. Holly has been trying one out for the last couple of months and is definitely loving it! A few weeks ago I was following a conversation on facebook between a group of mummies who were wondering how to transition their baby from the tight swaddling they had used in those first precious few weeks with their newborn baby, into the relative freedom and roominess of a sleeping bag. I think a lot of parents worry that when you slowly stop swaddling your baby tight that they will feel uneasy when you lay them to sleep and it can affect their ability to sleep peacefully. The ergoCocoon hybrid by ergoPouch is the perfect solution to this anxiety. It can be used as a tight, self-contained swaddling cocoon which holds your baby's arms tight against their body. Or, simply by unbuttoning the sleeves, it can be used as a more traditional sleeping bag with a little more room to move inside. ergoPouch sell a wonderful selection of swaddles and sleeping bags but this is the next generation - two in one!!! Holly's ergoCocoon is a natural coloured light organic cotton (although it is available in grey, pink and blue as well). 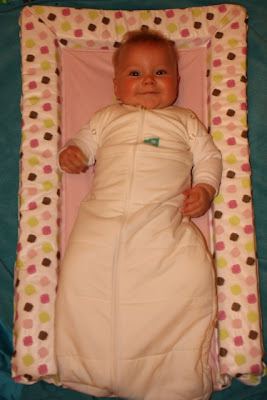 With the arm-holes fastened to make a swaddle, it is suitable from about 3 months upto 12 months but if you are happy to use it just as a sleeping bag then you can use it from birth. When we first got it, Mr. B. was worried that it was very tight already and that holly wouldn't fit into it but you see, that's the point! It's supposed to be tight to swaddle your child and offer them the comfort of closeness when they sleep. The quality of the fabric is outstanding. This is a very luxurious item that any parent would be proud to place their baby in. At £42 it is more expensive than many baby sleeping bags but you can definitely see why. The top half of the ergoCocoon Hybrid Swaddle is a 1 tog stretchy fabric and further down it is a 2.5 tog cotton sleeping bag. On the inside it is lined with organic bamboo terry fabric to be soft and reduce humidity. All in all, it seems to do a very good job of keeping Holly warm where she needs it, but cool enough for her to settle. I love the flexibility that the hybrid swaddle has. Holly likes to fall asleep with her arms free but will quite often wake herself up in the night by bashing her face with her hands so with this I can gently slip her arms back in once she has fallen asleep and then fasten up the poppers. I find the zip a bit tricky to undo and once or twice found myself having to really root around Holly's neck to unfasten the zip. Thankfully there is also a zip at the base (it is a two-way zip) so if all I want to do is to change her nappy then I can use the bottom one instead to stress her out a bit less. This is also intended to make it easier to put your baby into a car seat or pram harness without waking them but personally, I wouldn't attempt it just because it would result in bunching of the bag around the crotch strap of the car seat (and because Holly ALWAYS wakes up when I put her in the car). 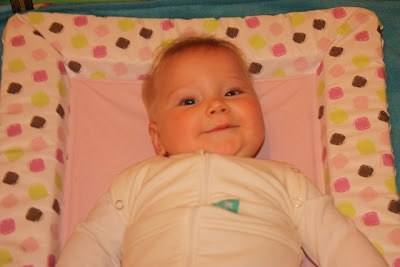 You can find out more about ergoCocoon Hybrid Swaddle at www.snuglittletots.co.uk.